Physics beyond the standard model has its ups and downs. Ups like mountains in the Netherlands, and downs like the Marianas Trench. Whenever something exciting seems to happen it's the telltale sign that a really big hammer is about to come down. Last week the D0 experiment at the Tevatron presented the new measurement of the same-sign dimuon charge asymmetry in B-meson decays. This asymmetry probes CP violation in B-mesons, including the $B_s$ mesons that have been less precisely studied than their $B_d$ friends and may still hold surprises in store. D0 claimed that their measurement is inconsistent with the standard model at the 3.2 sigma level and hints to a new physics contribution to the $B_s \bar B_s$ mixing. 3 sigma anomalies in flavor physics are not unheard of, but in this case there were reasons to get excited. One was that the $B_s$ system is a natural place for new physics to show up, because the standard model contribution to the CP-violating mixing phase is tiny, and theoretical predictions are fairly clean. The other reason was that the D0 anomaly seemed to go along well with earlier measurements of CP violation in the $B_s$ system. Namely, the measurement of the $B_s$ decay to $J/\psi \phi$ displayed a 2.1 sigma discrepancy with the standard model, and some claimed the discrepancy is even higher when combined with all other flavor data. In other words, all measurements (except for $B_s \to D_s \mu X$ that however has a larger error) of the phase in the $B_s \bar B_s$ mixing consistently pointed toward new physics. Not any more. Two days ago D0's rival experiment CDF presented crucial new results at the FPCP conference - a major sabbath of the flavor community. CDF repeated the measurement of the CP violation $B_s \to J/\psi \phi$ on a larger data sample of 5.2 inverse femtobarn, that is with 2 times larger statistics than in the previous measurement. And they see nothing: the result is 0.8 sigma consistent with the standard model. A 1/1000 fluke? That's a bad day. I guess half of all 3σ results really are wrong. "Whenever something exciting seems to be happening it's the telltale sign that a really big hammer is about to come down." This disgraceful episode would *never* have happened in *theoretical* physics! this might seem so, but it is kind of the red light syndrome. you know, when you think that you are disfavored by chance because you experience so many red trafic lights. point is, you usually don't notice the green ones. same here. flavour physics is literally full of observables. there are literally hundreds of channels and you are bound to find one that is off more than 2 sigma. add to that the error of the error. they say 3.2 sigma. it could very well be just 2.8.
there is a very good reason that in particle physics nothing below the 5 sigma level is considered a discovery and no, this is not incompetence on the part of the people analysing the data. it really is just statistics. Comparing this CDF result to the DZero asymmetry result is like comparing apples to oranges. The CDF paper released a couple weeks ago and mention here and in the Resonaances blog does not confirm or disput the DZero result. 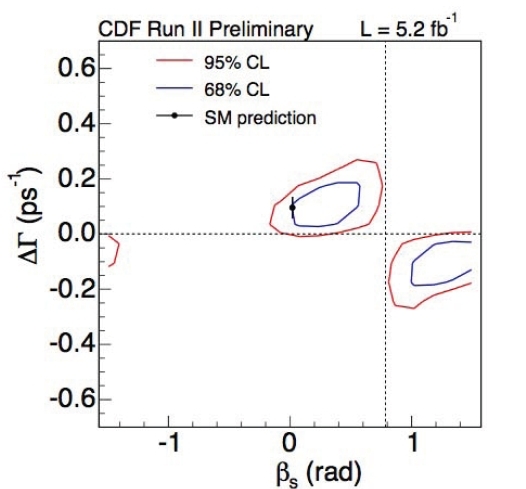 The CDF collaboration did release a sin(2beta_s) result a few weeks ago that looked at CP violation states and found the discrepancy between the amount of particles that decayed to matter versus antimatter in line with the Standard Model, the opposite of what DZero’s study found. The CDF study is an update of a 2007 meson decay analysis that both CDF and DZero conducted where both found discrepancies in the preference for decays to matter and antimatter. The recent CDF update of this analysis, which is being submitted to the scientific journal Physical Review Letters, found a smaller discrepancy than in 2007. DZero has plans to conduct its own update. However, comparing the updated CDF study and the current DZero asymmetry result is like comparing apples and oranges. True, both studies look at CP violation in meson decays, which can be used to search for “new physics” beyond the Standard Model. However, while the studies look at the same underlying physics, they use vastly different approaches and analysis methods that renders it impossible to draw a conclusion from the CDF study that would deny or confirm the DZero asysmmetry result, according to CDF leaders. Also, the uncertainties of both measurements more than “cover” the disagreement – so neither rules the other one out. What the CDF study does do is highlight the need for CDF to conduct an apple-to-apple type study of the current DZero result that would have the potential to validate or invalidate it. While there was some initial discussion, even among CDF collaborators, about whether CDF could perform the same search because the magnet construction in its detector differs from DZero’s, CDF collaborators believe they can reach the same level of sensitivity as DZero to the decays. CDF conducted a similar apple-to-apple type study several years ago, but with a much smaller dataset, not enough to make a judgment either way, according to collaboration leaders. The DZero result is based on more than 6 inverse femtobarns in total integrated luminosity, corresponding to hundreds of trillions of collisions between protons and antiprotons in the Tevatron collider. However, the success of CDF’s past study, leads CDF collaborators to believe they can conduct a larger, comparable analysis, although in a slightly different fashion, than the past CDF study and the current DZero study. June that it will perform this analysis with its full data set. The duration of the study will depend on the amount of preliminary work conducted, but collaborators estimate a result in time for a presentation at the winter 2011 physics conferences if the CDF search turns out to be as competitive as DZero’s. hey Jester, what's up with this rumor of a 3 sigma higgs at ~ 130 GeV? New Physics Claim from D0!